Come As You Are at the 2012 Vancouver International Film Festival. 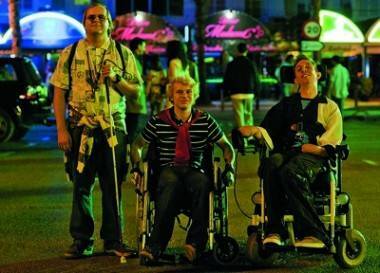 Come As You Are – Come As You Are is a charming, human story about three disabled Belgian men accompanied by a nurse on a road trip to a brothel in a Spanish coastal town. Ingenuous Jozef is almost completely blind, headstrong Philip is a paraplegic, and young Lars suffers from a degenerative cancer that has bound him to a wheelchair and causes occasional fits. Each of the men are humorous and charming, unafraid to poke fun of each other’s conditions. Tired of constant care by family members, all dream of one thing: to know the feel of a woman’s body. Worried, doting family members hang in the background. Their nurse, Claude, (not their first choice for a nurse, being female) is a no-nonsense, emphatic woman who listens more than she speaks, but not for lack of originality. Throughout the course of the movie, she changes from an unkempt mess in a tracksuit with bright, deep, innocuous eyes to a woman with a deep knowledge of simple pleasures and an assertive charm, as the audience gets to know her better. Expectations, hopes, and fears all fight each other within each of the men and, at times, the cramped confines of the group’s beat-up orange van cause tension but the foursome arrives at mutual respect before they reach their destination. The narrative develops each of the four main characters with such charming detail that they might walk off the screen and accompany movie-goers in their lives for days to come. The story is about friendship, love, and playing the best game with the hand one is dealt. Come As You Are breaks dull stereotypes and gets down to the humanity of its characters. It won the Grand Prix, Audience Award, and FIPRESCI prize at the Montreal International Film Festival in 2011 and the Audience Award at Karlovy Vary this year. The film will open your heart a little wider. Very memorable and highly recommended. Come As You Are plays Thursday, Oct 11 at 3:45 p.m at the Empire Granville 7 theatre. How to Grow a Band – How to Grow a Band is a documentary film about mandolin-virtuoso (and recent recipient of the McArthur genius grant) Chris Thile and his band, The Punch Brothers. It focuses on two years surrounding the release of the brothers’ genre-defying 2007 album, The Blind Leaving the Blind, and offers a good snapshot of the challenges that a band breaking new musical ground faces. The release of The Blind Leaving the Blind generated a lot of media attention because no publication could place the album into a genre. It featured a 40-minute long composition in four movements that thematically reflected Thile’s divorce when he was 23 years old. Some critics made attempts with “chamber grass” and “grassical”, alluding to the album’s unlikely mix of classical and bluegrass influences. But even though few could find words to describe the record, it was clear that its power was in the mix, irreverent to any one musical genre. 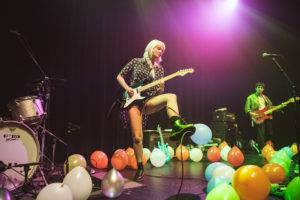 How to Grow a Band shows artists working at the edge of their craft. But because of its novelty, The Blind Leaving the Blind created a real challenge for some audiences. The album encountered resistance, as breaking new ground often does. Touring in support of The Blind Leaving the Blind thus provides the central conflict for How to Grow a Band. Footage from the first concert the band played in support of the album shows a tough audience, including a heckler demanding to hear “something good” and captures the band’s reaction to the performance backstage after the show. The film also shows the different opinions some of the band members had on how to present the new album. Thile shows a preference for challenging people and offers the view that a band should never “underestimate their audience”, while Gabe Witcher, the Brothers’ fiddle player, is shown favouring to mix the album’s presentation with more accessible pieces. Though the second half of the film feels a little bit long, How to Grow a Band is an honest portrayal of an artist doing something no one else has done before. It shows Thile pushing boundaries and “trying to be more than what [he is] naturally.” And that conflict between old and new is what some of the best art is about. Music fans and critics will want to see this film. Midnight’s Children – Epic. True to the book. Despite the two and a half hour run, Midnight’s Children is a film to see multiple times. What a story! Salman Rushdie, the author behind the novel that won both a Booker upon its release in 1980, and two “Best of the Bookers”, one each on the 25th and 40th anniversaries of the award, wrote the script for this adaptation. The story focuses on two babies born at midnight on India’s first day of independence and switched at birth, one Hindu and the other Muslim, one rich and the other poor. Their stories, and stolen, mixed-up, intertwined fates, provide an allegory for the life of independent India. Colour, music, movement; the cinematography is beautiful. The fast-moving script demands attention, surprise after surprise after heartbreaking surprise. As a testament to the power of “Midnight’s Children,” the film was shot in secret in Sri Lanka last year, to avoid protests. Hard to imagine how this film could be made better. An incredible production. A must see. Highly recommended. Midnight’s Children, with a script by the novel’s author Salman Rushdie. This entry was posted in Features, reviews and tagged movie reviews, Vancouver International Film Festival. Bookmark the permalink.